Though partial, the finger ring SAV1E 2882 is an excellent representation of ancient Egyptian personal adornment. 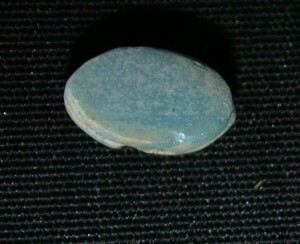 The ring is made from blue fayence molded into the form of a wadjet, broken through the shank (band) and at the opposite connection point with the bezel. The wadjet (or “Eye of Horus”) motif is amongst the most popular for amulets, produced from the Old Kingdom through the Roman Period. The imagery is taken from the loss (and recovery) of Horus’ own eye in his epic battle against Seth and was seemingly thought to protect the wearer from any and all types of harm. Like so many aspects of their material cultural, jewelry served a dual function for the Egyptians, being both amuletic and indicative of wealth, rank or social status. Even fayence benefited from this duality, as a material that was widely affordable and admired for its transformative properties. Thus, it is no surprise that fayence is the most common material used for the production of jewelry. Compared to other forms of adornment, finger rings have a relatively late appearance (Middle Kingdom) and would have been widely produced by the settlement of Sai in the Eighteenth Dynasty. Similar rings are known from many New Kingdom sites, but the emergence of the openwork bezel for wadjet rings at this time may indicate SAV1E 2882 holds a humble place amongst its contemporaries. 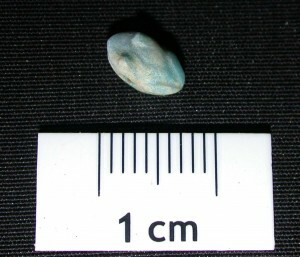 A very small faience object delighted us this week: a nicely done, really tiny (only 8 mm in lenght!) 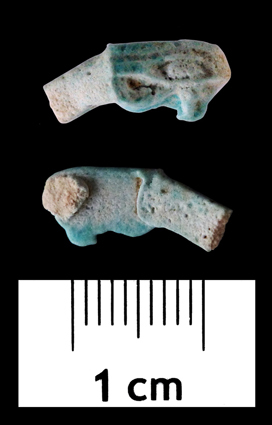 amulet in the form of a squatting frog with open mouth came up while cleaning around feature 28, the Post-New Kingdom stone foundation in Square 2b. It is in fact an uninscribed frog amulet or scaraboid as the flat, oval base was left uncarved. The amulet was obviously once used on a string – whether on a necklace or a bracelet remains open – it has a regular perforation at its lateral side, piercing the amulet in the centre, not longitudinally. Unfortunately, the archaeological context – found in dense mud debris with mixed ceramic material, filling material of the depression south of feature 28 – does not provide any glue for dating. In Ancient Egypt, frogs were primarily associated with fecundity, (female) fertility and birth – they are common amulets used during a long time span, both for the living and in funerary contexts. 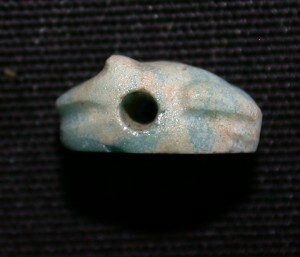 Beads in the form of frogs are also well known from New Kingdom domestic contexts – for example in Egypt in Amarna (see Anna Stevens 2006. Private religion at Amarna, pp. 56-57) – however, the frogs there differ in shape and have a characteristic upraised head. Very small frog pendants or amulets are reported from Eighteenth Dynasty votive contexts in Egypt – these I will have to check back home with a proper library! It would of course be tempting to connect SAV1E 294 with the temple area in the Pharaonic town of Sai! But as amulets in form of frogs survived well beyond the New Kingdom, until the Ptolemaic time and were also common in later phases of Nubian cultures (e.g. in Napatan tombs), I definitely want to deepen the search for parallels before our small frog from SAV1E can be tentatively dated by analogies! Regardless of its date, it is a very nice artefact and one of this season’s favorites!